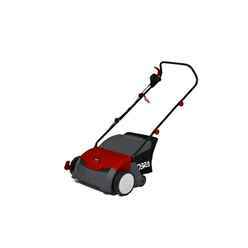 ILikeSheds has a large selection of Lawn Mowers to suit any garden. When choosing your lawnmower, the key factors to consider are: the size, shape and turf type of your lawn. You will also need to think about the quality of finish you are looking for and how much time you want to spend keeping your grass looking its best. 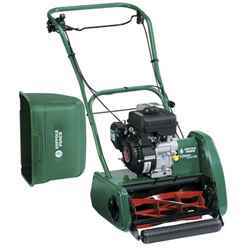 Hover mowers are rotary blade lawnmowers that literally hover over the surface of the grass. They are often electric powered but bigger petrol powered models are available. They don't usually have wheels, but some models now have rear wheels to make it easier to move them into position for mowing. 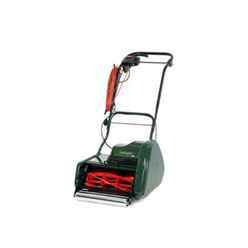 The handle folds so you can hang the mower from a shed or garage wall - usefully saving you space. 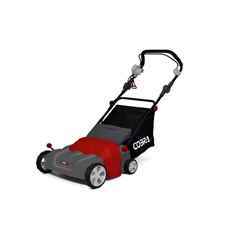 Cylinder designed lawnmowers can come as electric lawnmowers, petrol-powered ones or simple hand-pushed models. 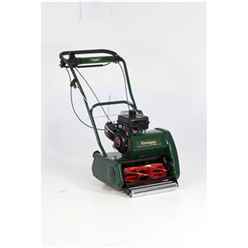 The blades rotate vertically like a cylinder against a bottom blade and this gives a scissor-like cut for a well-manicured lawn. 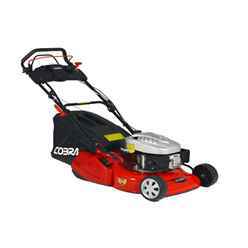 Cylinder mowers are perfect for level lawns where you're after a really fine, short cut. They come with a variety of cutting widths, rollers for a striped effect and a detachable grass collection box. 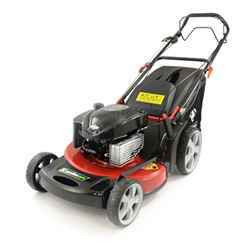 Our bestselling electric cylinder mower is the Allett 12E Electric Cylinder Lawnmower which is perfect for giving a dream finish to small to medium gardens. 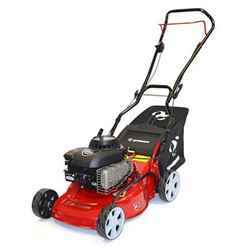 Our bestselling petrol cylinder mower is the Allett Kensington 17K which provides the ultimate finish leaving lawns in pristine condition. 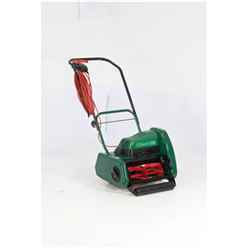 Rotary lawnmowers are extremely versatile and cope with most types of lawn, rougher grassy areas and difficult, sloping banks. 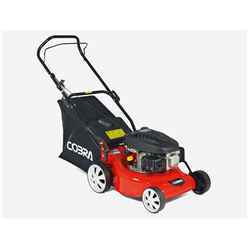 You can choose from electric rotary lawnmowers or petrol-driven models. 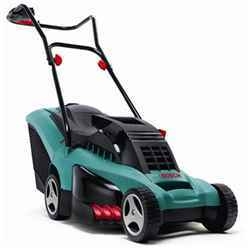 There are manual push or self-propelled versions available. 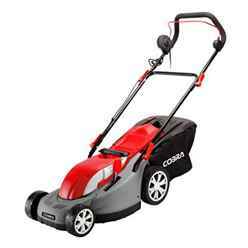 Rotary lawnmowers with rear rollers provide a better finish to the lawn and allow the classic striped lawn effect to be created. 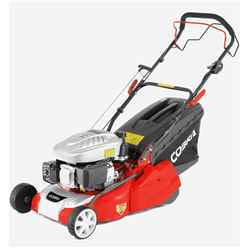 If you have a big area to cut or you have difficulty pushing a lawnmower, then a self-propelled model is definitely worth checking out. 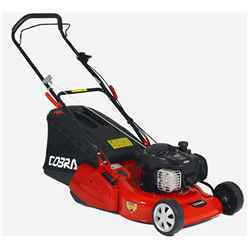 On a rotary lawnmower the blades rotate horizontally at the selected cutting height. The grass is then thrown out at the back into a collection box. If you don't want to collect the clippings, simply take off the box. 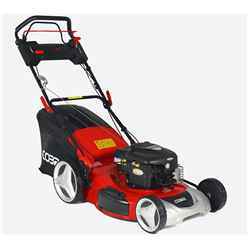 Our bestselling Rotary Lawnmower is the Gardencare GCLM46SP Self Propelled Lawnmower which is exceptional value for money providing features that you would normally expect from much higher priced machines. 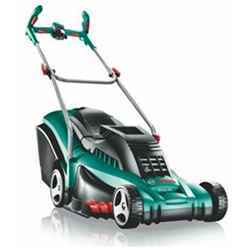 The size of your lawn is very important when deciding whether you need a petrol lawnmower or an electric one. 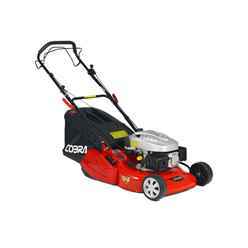 Electric lawnmowers are great for smaller lawns. Light and manoeuvrable, they're easy to handle and the electric cable shouldn't cause you any problems. 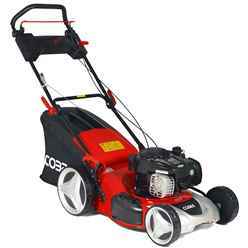 If you have a medium-sized lawn an electric lawnmower is still fine, but you might prefer a smaller petrol lawnmower. For starters, there won't be a trailing cable to worry about. 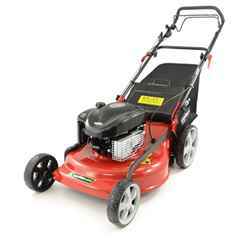 And petrol lawnmowers have that extra power to give a great cutting performance. They'll still be light and easy to handle, too. 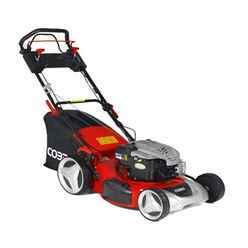 If you have a large lawn, you'll want to get the mowing done as quickly as possible. 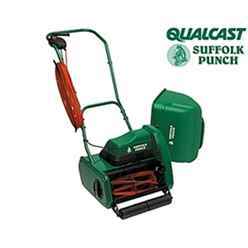 That's when a more powerful petrol lawnmower really comes into its own. 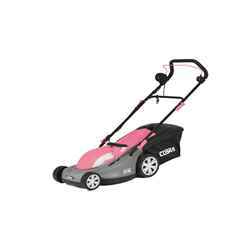 It will cope extremely well with a big expanse of grass without overheating. Petrol lawnmowers save you time in other ways too. 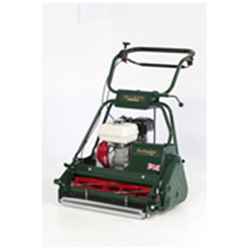 The wider grass cutting blades and bigger grass collection boxes are also very useful. 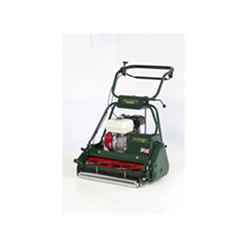 Many are self-propelled – this is a huge help when you have a big area to cut. Up to 100 square metres we recommend Electric. 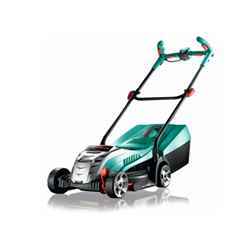 100-250 square meters we recommend Electric or Petrol. 250 square metres plus, we recommend Petrol. 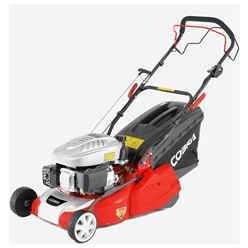 Your three main types of lawnmower can be electric or petrol-driven but some cylinder mowers are hand-push. 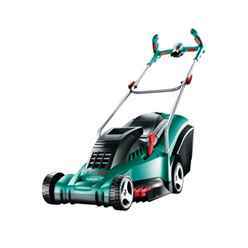 Electric lawnmowers are cleaner and lighter than petrol mowers and need minimum maintenance. And they're ideal for people who don't have a lot of time - just plug in and go! 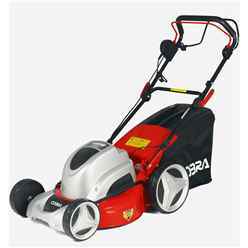 If you have a small or medium lawn, go for an electric lawnmower. You will need a power source close by, and watch out for that trailing cable. 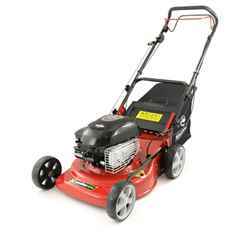 Always install an RCD adapter when using an electric mower. Test the RCD to make sure it's working. Never cut the grass when it's wet. Choose a machine with an integral cable and plug tidy so you can reel the cable in. Get a mower with a lock-off switch so the machine can't be switched on before you're ready. 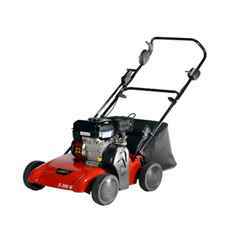 Petrol Lawnmowers are more expensive than electric models. They need more upkeep and you'll have to have some petrol stored. 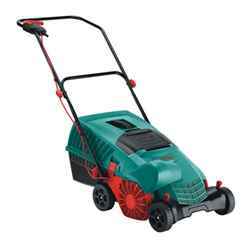 But they're a great choice for larger gardens where you want that extra bit of power. And you won't have a trailing cable to worry about. 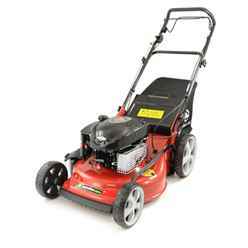 Petrol mowers come with electronic key ignition or a recoil starter. 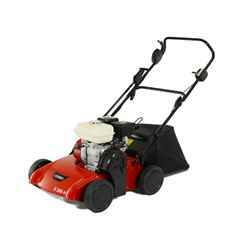 Mowers with electronic key ignition usually cost a little more but they're simple to get going. 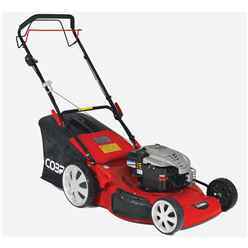 With the recoil starter, just pull on the starter cord to begin mowing. The recoil action might not be best for infirm or elderly users as you need a bit of strength to pull the cord. 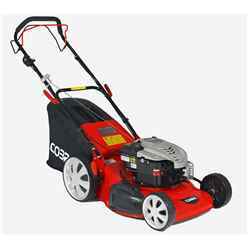 If you're worried about the weight of a petrol mower, think about a self-propelled lawnmower. There's no need to push so they're really easy to handle. 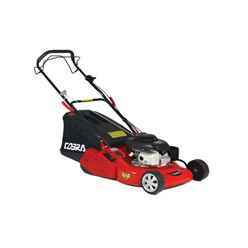 Some self-propelled lawnmowers have variable speed control. You simply adjust to match your walking pace. Some cylinder models are propelled manually. 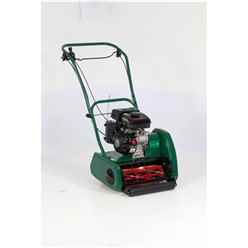 Inexpensive and easy to maintain and store, the manual cylinder mower is perfect for small lawns or tiny spaces where you need a really close, fine cut. 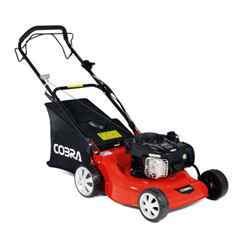 But if you have difficulty pushing a mower or your garden is on a slope, choose a power mower. Most grass boxes are detachable - you decide whether you want to collect grass clippings and compost them or just leave them to be reabsorbed into the soil. Obviously, the bigger the grass collection box, the fewer times you'll need to stop and empty it. Some hover lawnmowers also compact grass in an integral collection box. That means fewer trips to the compost heap! A clear viewing panel on the collection box lets you see how full it is - you can empty the box before it overfills and chokes the mower. 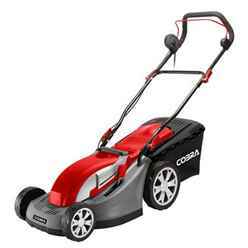 For a perfect striped-effect lawn we recommend a mower with a rear roller. As the mower cuts, the roller travels over the grass and flattens it in one direction, which gives that stripy effect. A rear roller also lets you mow up to and over the edge of borders. 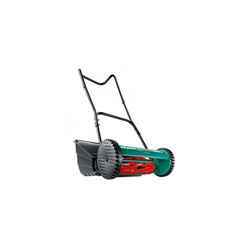 Rotary, cylinder and hover mowers with rear wheels are all available with a rear roller. 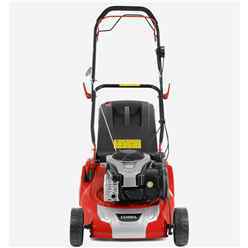 We have a large selection of petrol cylinder lawn mowers and out best seller Allett Classic 14L Petrol Cylinder 35cm Lawnmower comes with free delivery.